The reception is the first point of contact between your customers and your company. It is the area where your customers will form the first impression of your company that will largely depend on how your reception signs are designed and displayed. The interiors of your office can help in setting up an impression of your company on your client’s mind. Your office signage needs to leave the right impression of your brand upon your employees, customers, suppliers, and shareholders. 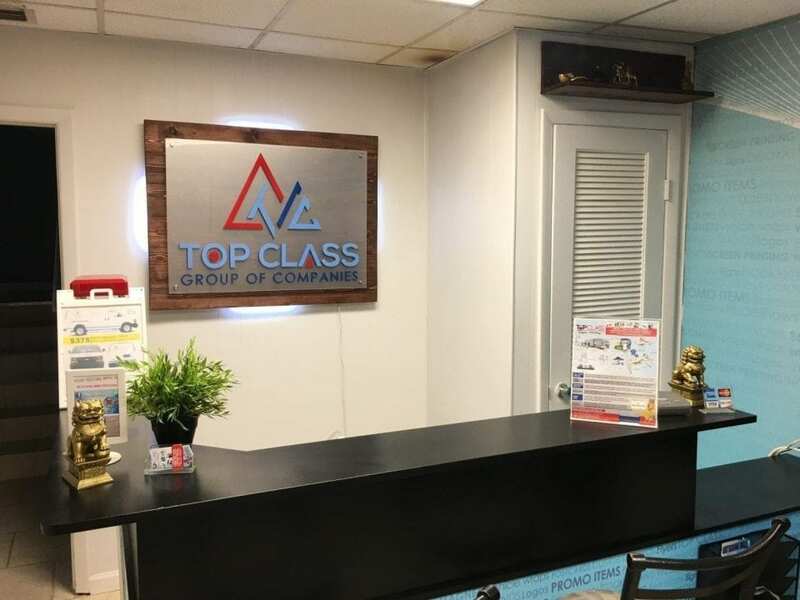 For all your needs, Top Class Printing is an expert in designing the perfect 3D interior office signage in Miami for you; whether you want to look trendy, neat and tidy, or old school. Our designers can design the best signage that suits the kind of brand image you want to display in the market. What is the use of interior signs? 1. A sign can easily send across your message to your customers in an appealing and interactive way. Nice office decor helps in setting up a light mood of your customer and he instantly feels at ease. 2. Interior office signs guide your customers through your office serving as a guiding map. For someone who is new in your office, these interior signs help in getting them to where they want to go. Put your signs in the right place that can help your clients. 3. Your clients should not feel that your office looks so grand and attractive from outside but fails to impress from inside. Putting up nice and attractive interior signs and decors at right places don’t put up a dull and boring image of yours in front of your client. The indoor wall signage help in creating an environment that is as pleasant as possible. We acknowledge how important it is for you to tell your story in the form of signs in the most compelling fashion using few or no words. Creating customized office signage is what we are known for because we are simply excellent at what we do. Remember that creating a dynamic work environment is also good for the productivity of the employees. Employees who work in a fun and productive work environment are a better asset to their company than their counterparts who work in a dull work environment. Simply stated, interior office signage provide one of the best ways of presenting your brand, increasing sells, setting the mood in the workplace, and keeping things alive. Make your Office more inviting with 3d Interior Office Signage for your reception areas, lobby, and office interiors. Why chose Top Class Printing for Interior Office Signs? Our designers can design the best signage that suits the kind of brand image you want to display in the market. We approach each signage and custom 3D interior office sign design differently. No matter what type of design you choose for your dimensional signs, we will ensure that we create something elegant, that can bring the magic of office design. We can custom fabricate and manufacture almost any kind of sign. Top Class Signs and Printing Miami has a talented team of sign builders, crafters and installers to make your office look magnificent. Our procedure of delivering the right custom sign for you is quite simple. We take care of your budget and never over-price you. All our prices are fixed so you do not have to worry about overpricing. We first figure out what custom design you can afford according to your requirements. We give you the best possible results according to your requirements and budget. If you have any specific requirements but your budget doesn’t allow, we can always give you what you want with different materials at your cost. You can choose from a variety of architectural grade metals, acrylic, PVC, brushed and metal laminates with Top Class Signs And Printing Miami. Each letter and piece of your logo is individually cut and positioned on your wall for a sophisticated and professional look. Panel Signs – Acrylic Stand Off Sign (starting at $150) – Positioning your custom sign on a standoff panel will add nice 3D raised effect. This also makes it easier to install and move, typically with only 4 screws. Choose from a variety of panels including clear or frosted acrylic, brushed aluminum, PVC, and wood. We can also add led lights and dimensional logos for a better 3D effect. Standoff wall signs can largely make your office lobby from boring to exciting. Cut Acrylic Office Sign Logos (starting at $200)– Choose colored and painted acrylic colors for your interior office signage made by Top Class Signs and Printing Miami. This is our favorite choice for 3D logo signs as they offer precise laser cut quality. Foam With Metal Laminate Logos (starting at $350)– You can get your laminate metal logos made from brushed and polished in silver, gold, bronze and copper metal faces with an edge of black, silver, gold or a custom color. Best suited for larger letters due to the routing process. We find out the right type of sign according to your budget and then decide what quote or image will be printed on it. We also give a mockup so that you are sure of it. Then once you have approved it then only we start its production. We also provide installation service at the location you want your sign to be. Most of our signs can easily be installed by anyone who is mildly experienced at handy work. This makes it a great solution for shipping you an interior office sign in Miami. We can also install 3D lettering for you or ship it across the country. To place our order for the best in class and quality custom interior signs, get in touch with us at (305) 433-5574 or call us on our toll-free number (888) 228-4521.